Nestled in the old Karantina’s Public School, we are a brand new hostel who aimed at preserving the division of the classes, and created an Exhibition area / Concept store, where young Lebanese and Arab designers exhibit their work. We also have another room with the role of a legitimate classroom, and in which we provide arabic courses and Workshops. You’ll get good vibes, comfortable accommodations, and unforgettable fun in this cool, centrally located hostel. We are located in one of the best areas of Beirut, near to some of the best attractions and tourist landmarks of the city such as Downtown Beirut, Martyr’s Statue and Nicolas Sursock Museum, among other interesting places that can be discovered and explored around our city. Plus, the area where Beirut’s coolest bars are is just 5-minute walk from the hostel! 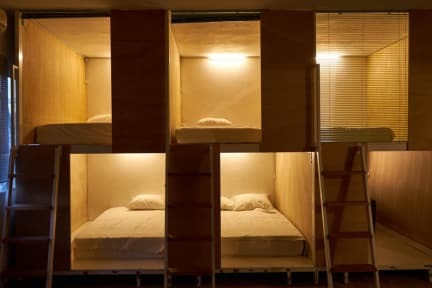 The rooms consists of box like beds, Each box/bed has a small light and electricity plug to recharge your phone. The beds are made in a box like concept which gives you privacy and room like feeling. The hostel includes also a common living space, free lockers, bathrooms and showers. Last but not least we have a KITCHEN, that you can use and cook your meals, which save you a lot of money if you are travelling on a budget. We are the cheapest hostel in Beirut even if we are the coolest. You can use the kitchen for free. This place is lush and down to earth. Staff / volunteers are all lovely, a mixed bunch and full of heart. Other guests were varied but invariably sound as 2 pounds. It's very calm and DIY re the personal experience, which I like - but also their plans for the place are great and something to look forward to. Sweet! I had a great time at the Colony. The people were so chilled they may have been frozen. A definite highlight was the group dinner on Sunday where you could experience and enjoy traditional Lebanese food with staff and new found friends. The staff were incredibly helpful arranging for a car to pick me up from the airport, chaperoning me to the hospital and translating when I needed treatment for an injury and providing general information about things to see and do in Lebanon. Amazing place and staff! It’s very close to the road where you can take mini buses or taxis to everywhere. The facilities are very good, hot shower, kitchen available, lockers and comfortable beds. Farid is very friendly. The staff are super awesome, the feeling there is like a big family. The beds are comfy and the position in close to the highway so it's easy to get around by bus. They have begun to put on events such as movie nights and other social activities. Say hello to the cats for me if you go! Absolutely amazing staff!! Incredible family atmosphere all working towards creating a great welcoming home feeling in the hostel for all. All the staff members go above and beyond for anything you may need. The beds are great and showers are hot! Many longer term travelers. Highly recommended, over 1 week is not enough time in the hostel. Awesome staff, good facilities and good location...what do you want more? Til 2020! This place is great! The staff is really nice, it is easy to get from other places in Lebanon. Also the sleeping boxes are very comfortable. If you come to Beirut, definitly stay here!